Fluids are practically incompressible and cannot, therefore, store pressure energy. 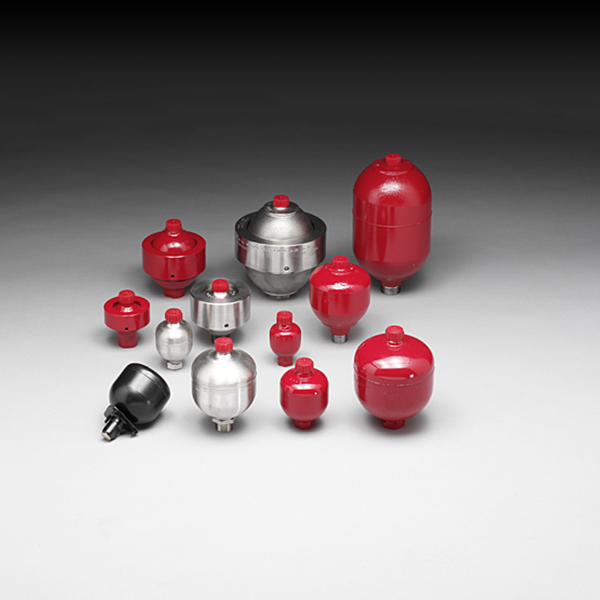 Also, the compressibility of a gas serves in hydraulic accumulators for storing fluids. HYDAC diaphragm accumulators are based on this principle, using nitrogen as the compressible medium. Indeed, a diaphragm accumulator consists of a fluid section and a gas section with the diaphragm acting as the gas-proof screen. Therefore, there is a connection of the fluid section to the hydraulic circuit so that the diaphragm accumulator draws in the fluid when the pressure increases. Therefore, it compresses the gas. When the pressure drops, the compressed gas expands and forces the stored fluid into the circuit. Moreover, there is a valve poppet at the base of the diaphragm. This valve shuts off the hydraulic outlet when the accumulator is completely empty and thus prevents damage to the diaphragm. What’s more, it is possible to fit the HYDAC diaphragm accumulators with an HYDAC Safety and Shut-off Block. This will lead to the compliance of the regulations of the Pressure Equipment Directive PED 97/23/EC and the German regulations on health & safety at work (Betr.Sich.V.). A low-maintenance and long service life. Accumulator shell materials: carbon steel, stainless steel, aluminium and others.